Elsa Banana Cookies info about the game-Games2Rule. 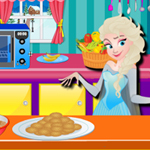 Elsa is cooking! The ice queen going to cook banana cookies but she don’t know the recipe so she needs your help in the kitchen, she knows you having the skill of a true chef! Choose the best ingredients you can find in the kitchen to create spectacular banana cookies. Elsa is the one you have to impress. So make sure your of banana cookies should be absolutely delicious!